- 7 tableau piles (below foundations) - build down in any suit but the same. 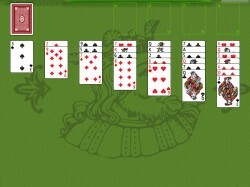 Groups of cards may be moved if they are in sequence down in any suit but the same. When only one card remains in a tableau pile, the card becomes a "protected" card. Protected cards may only be moved to a foundation and no cards may be played upon them. Protected cards remain protected until the stock is empty, then they become available for play on other tableau piles, and other cards may be played upon them. Spaces are filled from the stock, then by any card. At the start of the game 1 card is dealt to the first pile, 2 cards to the 2nd, and so on. The top card is face up.